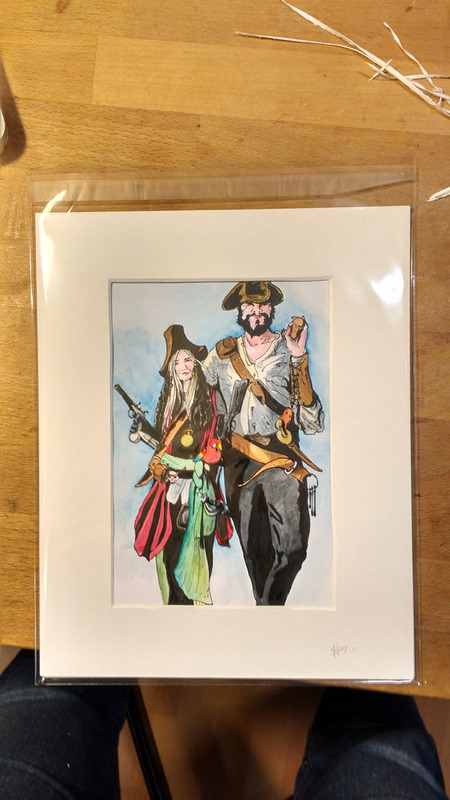 A really fun (if slightly infuriating) commission – to create an artwork featuring two wonderfully deranged pirates in full (and I mean full) costume. Seriously, I think they’ve got at least two guns and three blades each, not to mention all the straps, strings, parrots, hats, buttons, compasses, buckles and so on… Based on a photograph and taking style hints from a Deadpool poster, this is made with india ink and watercolours on bristol board. Also there’s a hint of metallic sparkle where appropriate.